When I was a kid, I looked forward to summer. Who didn’t? School is closed. Every day is spent playing outdoors and swimming. Also, my parents would take us to visit our grandparents in Eastern Samar during summer. And it goes without saying that we would have to drop by Tacloban and visit Gaizano and the Children’s Park. Gaizano was the only mall I knew of when I was a kid. I have fond memories of their kiddie rides. 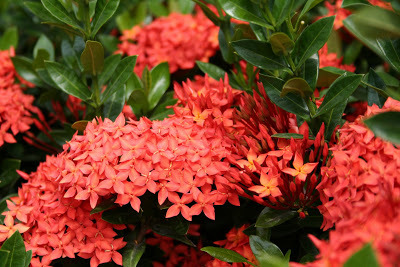 There were lots of summer activities back home but the highlight of them all is the Flores de Mayo (Flowers of May). 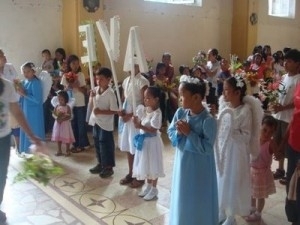 Catholics and Aglipayans celebrate the Flores de Mayo every month of May to honor the Blessed Virgin. From what I recall this is a two-part tradition. One is the Flores and the other is the Santa Cruzan. Back in my hometown, kids get excited for the Flores on hot summer afternoons. We wear white and pick flowers to offer to Virgin Mary. I remember my friends and I raiding our yards for flowers and sometimes our neighbors’ too. Santans in red, pink yellow and mostly, orange; hibiscus/gumamela, daisies and rosal are the usual choices. Bougainvilla not too often gets picked because it wilts easily. Roses are housewives’ treasures and therefore not up for sacrifice, not even for the Virgin. Before the Flores starts, there usually is cathechism, which we can barely get through due to excitement. As the novices and seminarians rave about the harps and angels in heaven and the fire and unending wailing in hell, we squirm in our seats, tightly holding the bunch of flowers that are slowly wilting as lethargy creeps in with the afternoon sun. Sweaty hands try to straighten the creases that start to appear on starched dresses while carefully avoiding the menacing glare of the saints at the altar. Our hearts start to swell as soon as cathechism concludes and the Flores commences. We hang in anticipation as the elders choose the kids who will be carrying the letters of the Ave Maria from the church entrance to the altar. The giant letters made of light blue and white crepe paper are the holy grail for the kids at the Flores. 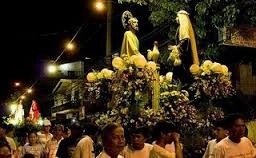 Basically, mass is celebrated during Flores with more emphasis on the virtues of Virgin Mary. We also sing the Salve Regina, which is in Latin, and surprisingly get the words right. Looking back, we didn’t really understand what the prayer meant since it was in Latin or if we were pronouncing it right but hey, it’s the thought that counts, right? After the mass, we would fall in line and are given treats. They used to give us galletas and candies. Depending on the mass sponsor, sometimes we get fancier pastries. And when I say fancy, as a five-year old, I meant bread with bright red or yellow filling. At night, the celebration continues in the form of the Santa Cruzan. This is a processional novena still in honor of the Virgin. I remember the elders constructing a bahay kubo as a makeshift altar with the image of the Virgin surrounded with flowers, both fresh and crepe paper. During procession, the rosary is recited interspersed with Visayan songs for Mary. The part I like best is we get to carry bamboo torches. You know how in the movies, the townsfolk carry torches to burn the village witch? We kinda look like that except ours is a solemn procession with some overeager toddlers running around. After the novena, snacks are served. And on some nights, if you’re lucky, there is social dancing. Back then, no one was embarassed to dance. Regardless of age, size and dancing skills or lack thereof, the dance floor never lacked of participants, all in the name of fun and camaraderie. 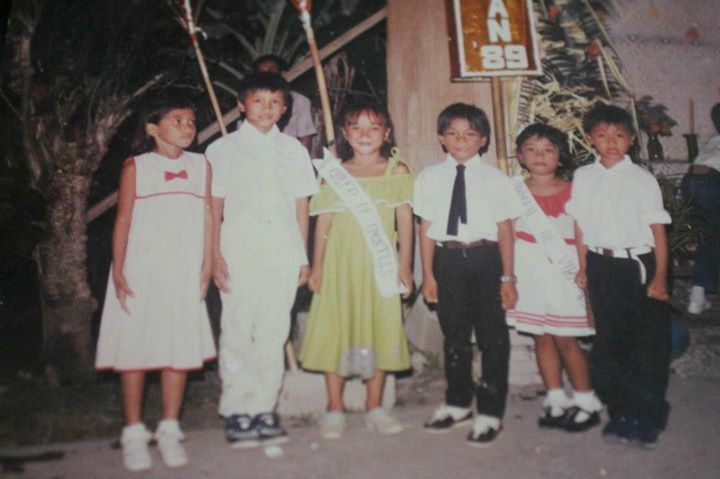 The culmination of the Flores de Mayo is on the 31st where there’s a procession and mass. 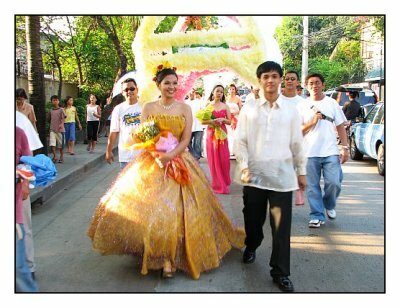 The sagala is no ordinary procession. This is some sort of religious pageant where good-looking ladies and gents of the community play biblical characters. This looks similar to a procession during town fiesta. Needless to say, this ends in a street party under a starry summer sky, all in the name of the Blessed Virgin. My Mom was a devout catholic and raised us to observe the lenten tradition. Easter Sunday is widely celebrated in the whole christendom and I remember my Mom waking us up at dawn and dragging us to church for the “sugat” (in Waray) or “salubong” in Tagalog. The event includes Virgin Mary meeting/reuniting with the resurrected Christ with young girls in white singing hymns and throwing flowers to the parishioners. When I was in fifth and sixth grade, I became one of those girls. I remember being so excited to wear a white dress and carry my little basket of flowers like a three-year old flower girl in a wedding. Just like many catholics (or Christians, for that matter). the whole meaning of Easter was lost on me. To me, Easter marks the end of lent, meaning we can eat meat again and that it was the culmination of the weeklong prayer vigils, stations of the cross, novenas and processions.Surely, those are more than enough reasons for a celebration. The resurrection of Christ is still a mystery to me as is his death and its significance. They keep saying we are celebrating the living God, the ever loving God, the one who loves us unconditionally and has given up His life so that we may be saved. I want to celebrate Easter the way I did when I was 10 and was wearing a white dress and carrying a basket of flowers. But I can’t. I’m way past innocence and has mourned the church I grew up in. Why is the church who preaches about love condemns the gays? Why wouldn’t it allow women to have choices regarding their own health and well being? Why is it covering up its own transgressions? How can they continue protecting the priests and other church officials who have molested children? How can the church be so wealthy when they preach about being humble and meek and renouncing worldly possessions? Easter is a new beginning. New beginnings give us hope. Hope is the light that guides us in the darkness that we live in. When everything else is gray and cold, we can hold on to that hope. We can hope that one day things will change for the better. We can hope that one day we would be closer to equality. But until then, we have to do our share and stop bigotry, condemn abuses and respect women and their choices. 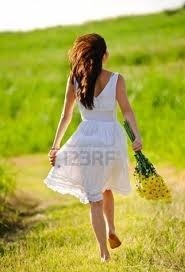 And when that day comes, I’d probably wear a white dress and carry a basket of flowers.